Terrace Place is an active living community for seniors located in McCandless, PA. 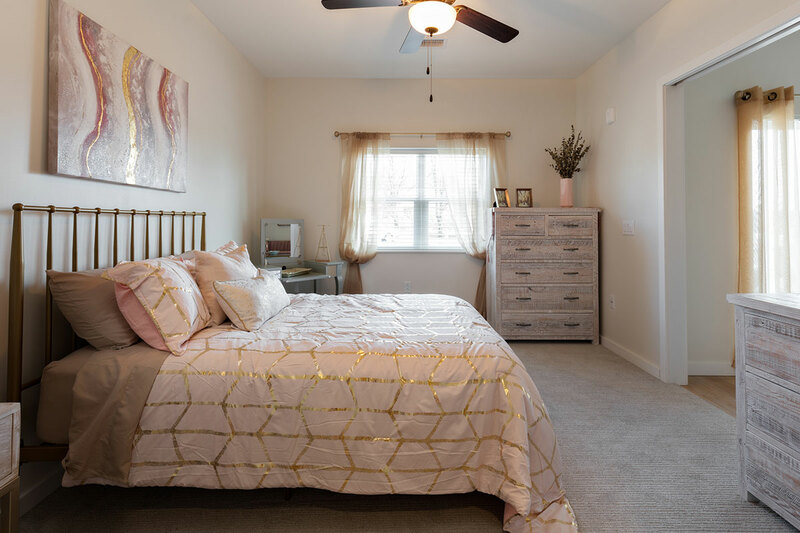 The community features an environmentally friendly concept that preserves ample green space on the property. 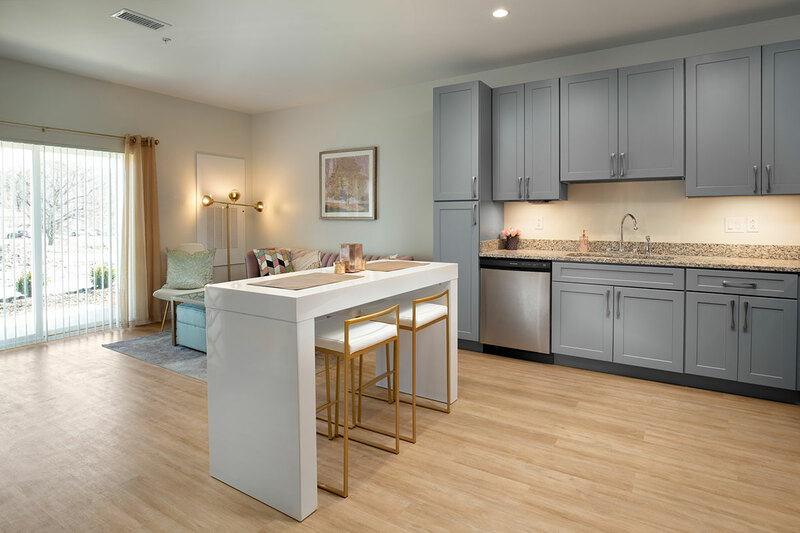 Terrace Place includes adaptive features like smart appliances, walking trails, outdoor multi-use areas and more to help our residents remain active as they live, and age, in place. 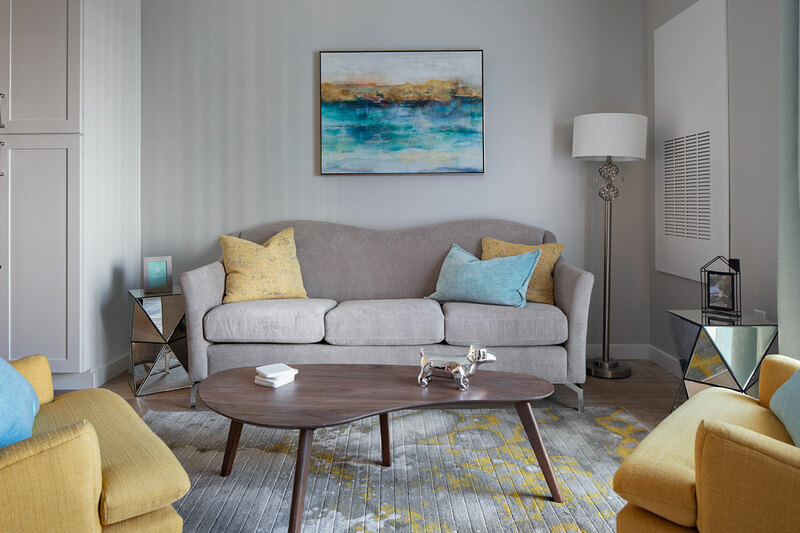 Each apartment is equipped with smart technology that helps you control things like your lights and temperature from a remote control or smart device. Terrace Place has 3 floors. 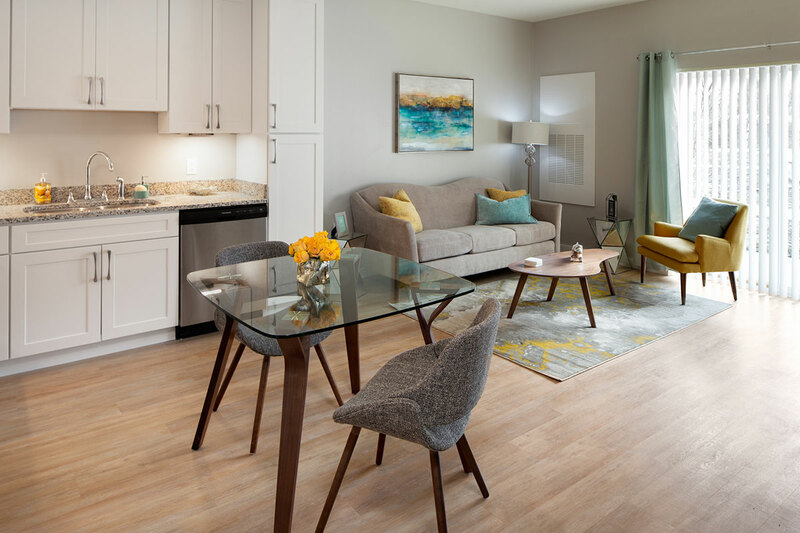 Apartments are reserved on a first-come, first-serve basis, so we encourage you to get your reservation in soon. Shopping Trips, Outings and more! Will I be able to choose my own colors for my apartment? 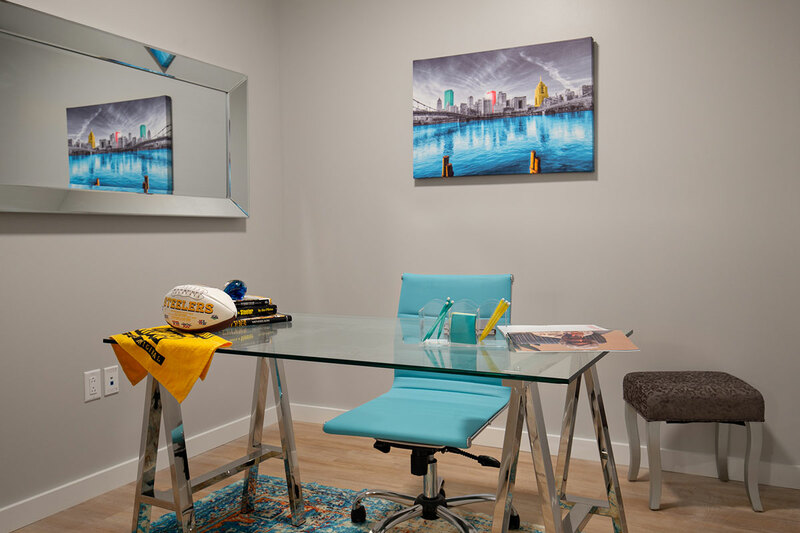 Once you move in, we welcome you to customize painting, furniture, etc. to your liking; however, the apartment will need to be returned to its original condition and format after you move out. Any customizations will be the responsibility of the resident. Depending on the work required, costs associated with this may be billed to you. 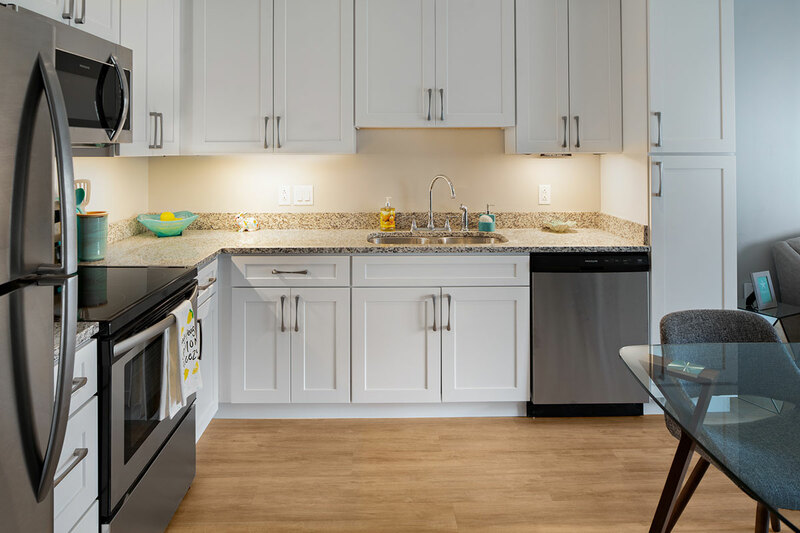 What kind of flooring and appliances do the apartments have? The master bedroom is carpeted. All other areas feature hardwood luxury vinyl tiles. 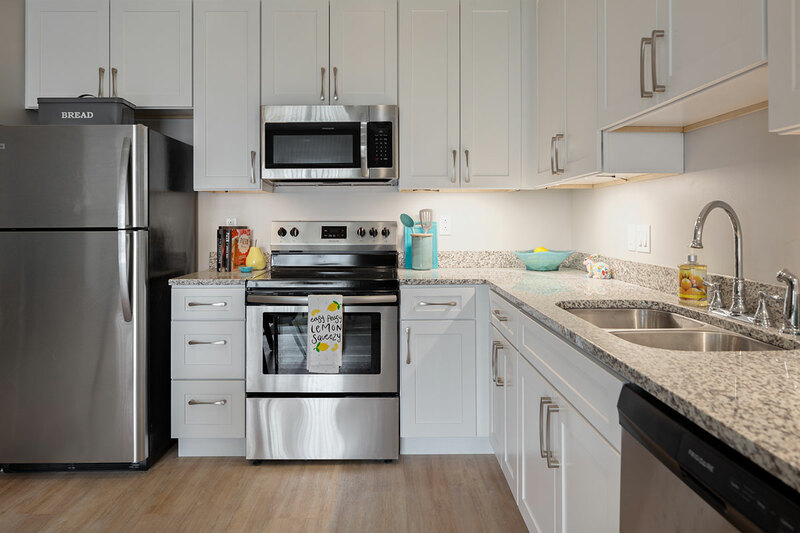 Kitchen appliances include a range, dishwasher, microwave and refrigerator (all stainless steel). 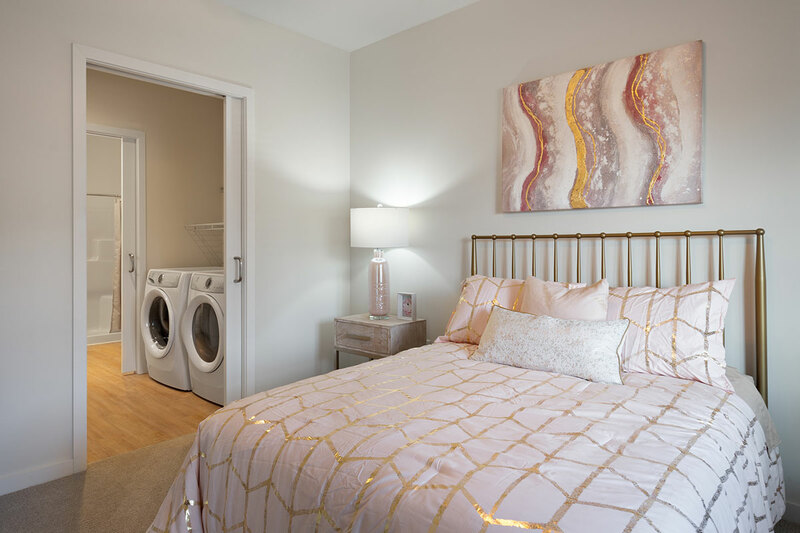 Each unit also includes a washer and dryer in the spacious master closet. Do the apartment windows and patio doors have blinds? All apartments feature slatted blinds that can be fully raised, lowered and tilted. Are there different floor plans available? All apartments have the same floorplan — as shown in this guide. The only difference is a patio for first-floor apartments and a balcony for second and third-floor apartments. I have heard that Terrace Place is “adaptive.” What does that mean? 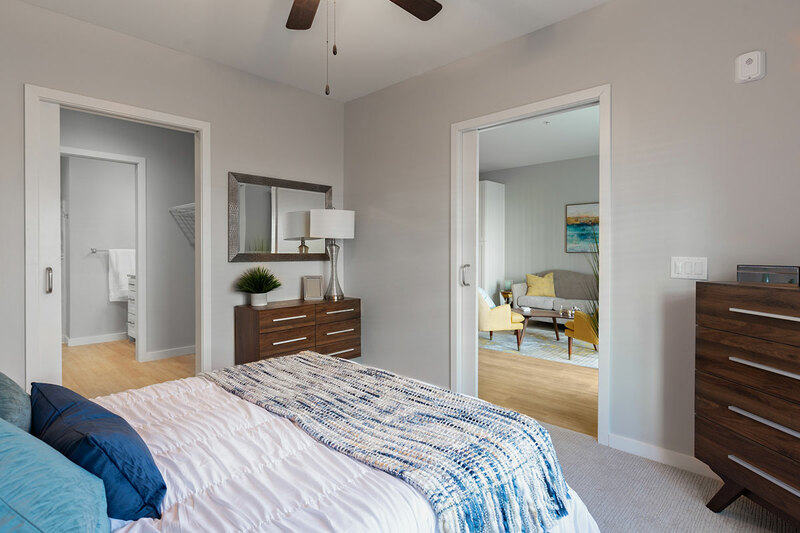 Each apartment is equipped with smart technology that will help you control things like your lights and temperature from a remote control or smart device. Bathrooms are designed with extra help available, like grab bars, should you need it. 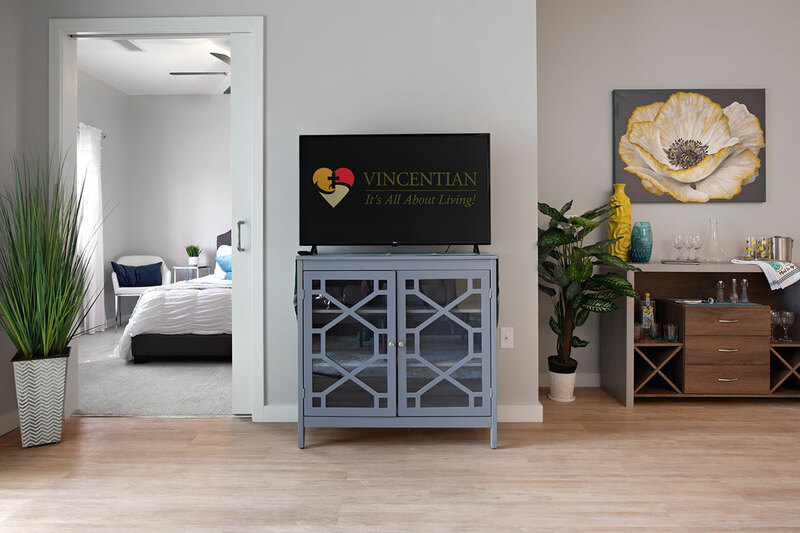 Vincentian is currently exploring partnerships with home health and other healthcare agencies to bring services you need directly to you. How many apartments are at Terrace Place? Terrace Place has 91 apartment homes spanning three floors. The first floor has garden level apartments with a patio; the second and third floors have balconies with metal railings. Can I choose my apartment location? Absolutely! 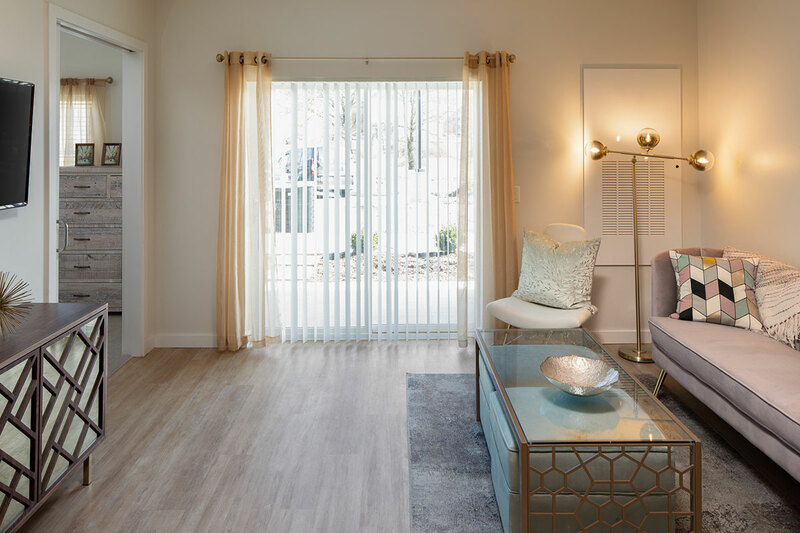 Apartments are reserved on a first come, first-serve basis, so we encourage you to get your reservation in soon. 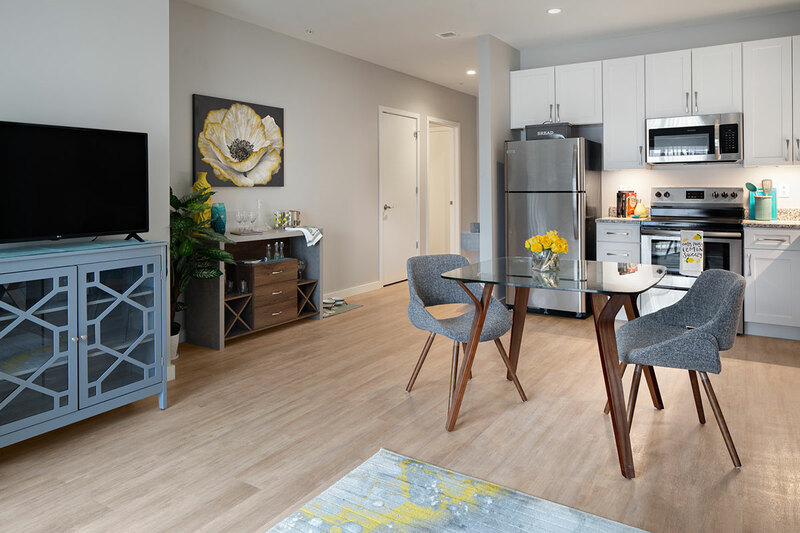 Rent includes all utilities, highspeed WiFi, maintenance to building and grounds, in-unit smart technology, parking, refuse collections, private on-site storage locker, transportation within a five-mile radius, programs and special events. Each resident is responsible for television and a landline phone package. No additional or hidden fees associated with meal plans, campus conveniences or other service fees will ever be charged at Terrace Place. Once I move in, how long will my rent stay the same? The amount you begin paying will stay the same through at least June 2020. Historically we have increased rent at Vincentian Villa (our other independent living community) by less than 3% per year. available. Regularly scheduled outings and trips to the grocery store also are scheduled. Will there be covered parking? All of the parking at Terrace Place is surface parking. There is ample parking areas for all residents and guest/visitor parking. Parking spaces will not be assigned. The parking lot is designed to accommodate covered carports should there be excessive demand from our residents; however, this is not part of the initial plan. Valet parking may be offered during inclement weather; however, valet service will not typically be available. Yes. Terrace Place does welcome pets of up to 40 pounds, as long as your pet is not a nuisance to your neighbors. A one-time pet fee of $250 will be payable with your first bill. How many elevators are on site? Two elevators are located on either side of the first floor lounge. Is Terrace Place a secure building? Yes, guests have to be “buzzed” in, and there is a video security system in public areas of the campus. Are there additional storage areas available to residents? 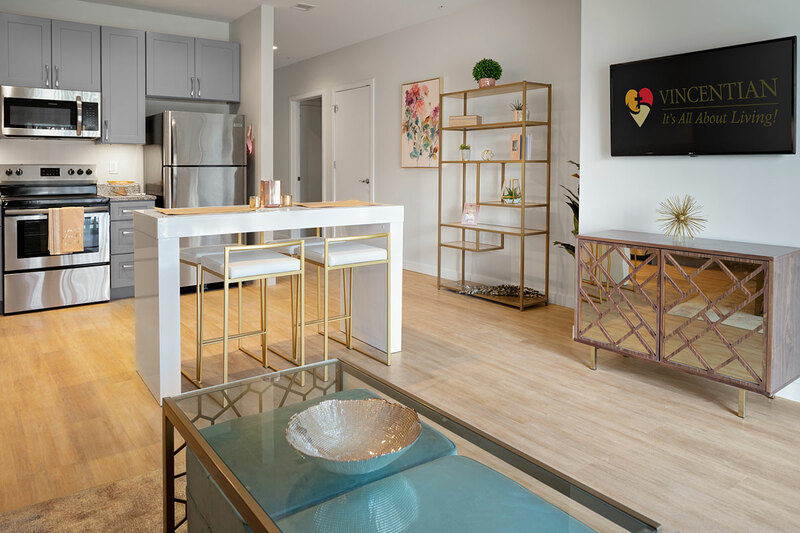 In addition to the spacious storage areas designed within each apartment, each unit is also offered a complimentary on-site storage locker for additional storage needs. What about access to religious services? Free transportation is available to any area of worship within a five-mile radius. Transportation to daily Mass at Vincentian Home is provided regularly, as many of our residents are Catholic. What types of community spaces are at Terrace Place? 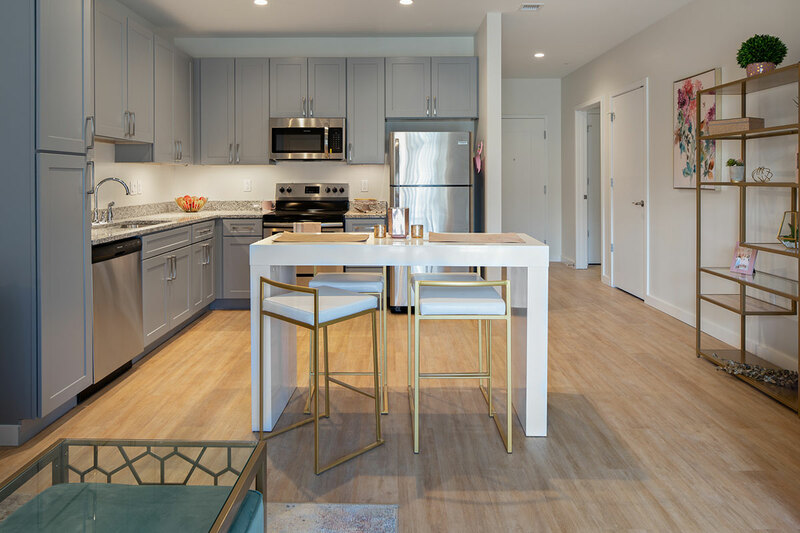 Terrace Place is designed to reflect the active and social lifestyles of our residents while honoring privacy and individual spaces. On the main floor, a beautiful lounge and self-service bar with a wall of windows overlook the scenic courtyard. Adjacent to this area is a spacious club room with an equipped kitchen that can be reserved for large private events. On both the second and third floors, party rooms and libraries suit smaller gatherings or group activities. 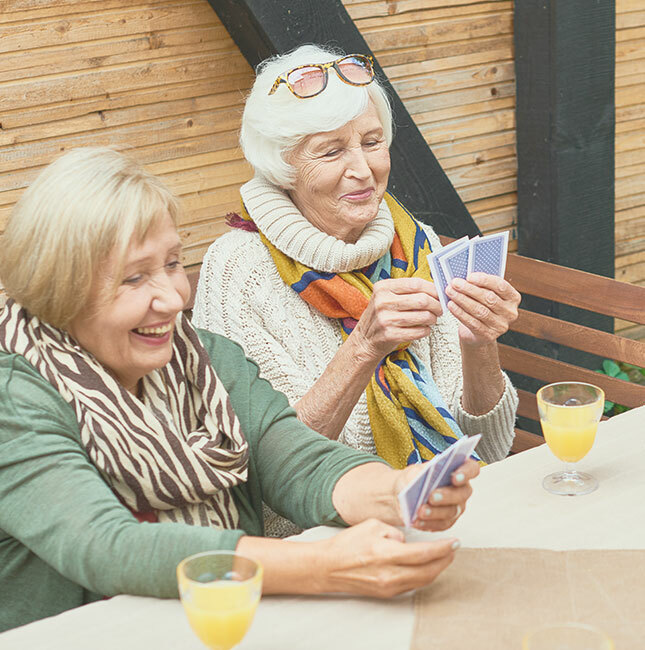 A host of recreational, educational and community programming are offered in the community spaces and tailored to fit residents’ preferences. These activities may include yoga, musical performances, tailgate parties, movie nights, etc. The possibilities are limitless! who entrust their care with us. Sign up today to be informed about Terrace Place at Vincentian, an innovative and active living community. This website features illustrations, which final measurements may differ slightly from acutal construct.